Get the latest! Download the 2019 Cyber Security for Healthcare Exchange agenda for info on speakers, sessions, and more! 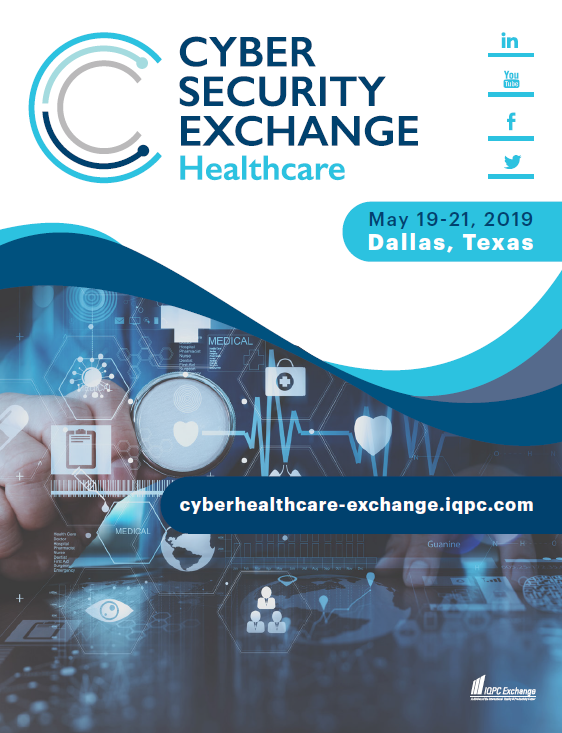 Join us May 19-21, 2019 at the Renaissance Dallas Hotel in beautiful Dallas, Texas for the Cyber Security for Healthcare Exchange! The 2019 Exchange will provide CISOs, CIOs, VPs and other heads of Cyber Security with a three-day event that delivers leading practices and dialogue-driven debates on key challenge areas, thought leadership discussions, and numerous networking activities. This exclusive, invitation-only event will be a capped audience of 45 Cyber Security executives from some of most recognizable organizations in the world including UnitedHealth Group, Alcon, St. Luke's Health Systems, Catholic Health Services of Long Island, Adventist Healthcare, Kaiser Permanente, and many more!. Evolving Threat Hunting: Ransomware, Wannacry, What’s Next? Realities of AI and Machine Learning- Is it Really Working? Learn more about the different sessions and networking opportunities by downloading the Cyber Security for Healthcare Exchange agenda today! Download our May 2019 agenda to see a sample of the speaking faculty along with interactive sessions!